Greetings one and all! Today is a sort of milestone in that I have been blogging for three years. I know it has been three years because this is my third annual IT'S BING CROSBY'S BIRTHDAY blog. Today we're going to take a personal look at one of the most popular recordings of all-time. A song that consoled hearts in wartime and cheers over-heated, grumpy shoppers to this very day. Few of us haven't enjoyed Bing's initial version of White Christmas in the 1942 release Holiday Inn. One mistake I made with that movie was showing it to my daughter Janet when she was young as her first Fred Astaire flick. It took her years to get over a certain animosity toward Mr. A for trying to steal Bing's girl! I should have started with Follow the Fleet. A song and idea that popular just had to be repeated and the 1954 film White Christmas became another holiday perennial for those of us who take a large dose of Christmastime through entertainment. Irving Berlin called White Christmas one of his "round" songs. A tune which seemed to compose itself, it came to him so effortlessly. His enthusiasm for the song never wavered. It seems that way as well with the public who has placed it at the number one of the Billboard charts 3 times since it was first heard. 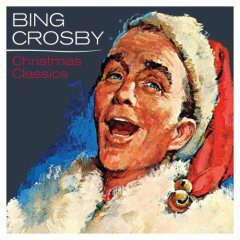 I understand there may be people out there whose favourite singer is not Bing Crosby (??? ), but even those souls probably consider Bing the master of White Christmas. Here's a fellow I know tolerably well. This is my son Gavin who has an amazing talent for mimicry which is not uncommon among those diagnosed as autistic. His independent language skills are not top-notch, but he knows every line from every classic Disney feature and short and can imitate everyone from Jerry Colonna to Kathryn Beaumont. The Christmas before last I was baking and listening to the radio in the kitchen. AM740 was obliging me with Christmas songs and they gave out with Frank Sinatra singing White Christmas. Suddenly Gavin was beside me. He shut off the radio and turned and stared at me with wide eyes. The wide eyes generally mean Gavin is ready to say something important like the time he couldn't figure out Easter and wished everybody a Happy Thanksgiving. This time he didn't "say", he "sang". He sang White Christmas. He sang White Christmas in a perfect imitation of Bing Crosby and the record he's heard since birth. When he finished Gavin returned to his endless video loop of How the Grinch Stole Christmas. My husband looked at me and said, "Frank's been told!" My Gavin moments are special, and this one came to me courtesy of the spirit of Bing Crosby which lives in music and movies. I raise a toast to that spirit. How 'bout that! I raise a glass, too. A toast to the timeless spirit of goodwill to all. Right back at ya', novabreeze. Happy anniversary to you, happy birthday Bing, and happy every single day to our crooner, Gavin. Gavin will like to have a message from a "computer friend". THREE YEARS?! Amazing. The boy has perfect taste, thanks for sharing. Children, especially your own, constantly amaze. I think I know Gavin, having taught "Special Education" for 8 years. I would not have loved the profession if it were not for the Gavin's of the world. I learned far more from them than they learned from me. I have infinite patience and love for all things - great and small (especially the small) - because of the Gavin's out there. In the late 1980's, I wrote a poem called "Autistic Angel". The Autism Society of America published it as their "official poem." I don't think that they still print it in any shape or form but it meant something 20 or so years ago. Born unusual in a usual world. Described in terms that you will never understand. By existing, you stir your mother’s heart. Sighs of pity resonate in your presence. You take what you want. Do you wish hope for us? Is this a holy punishment? Is a pure heart a divine penalty? "Are we the sleepers?" I often wonder. 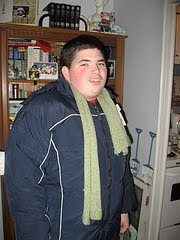 Gavin has been accepted in residence at a group home run by Community Living. There are four other young fellows his age. The change from "extended respite" to residence seems to entail a subtle shift in power between parents and staff. Interesting. The shift may not be fun but it is necessary. His adjustment is probably harder than yours or theirs. Life is a journey and it is long.